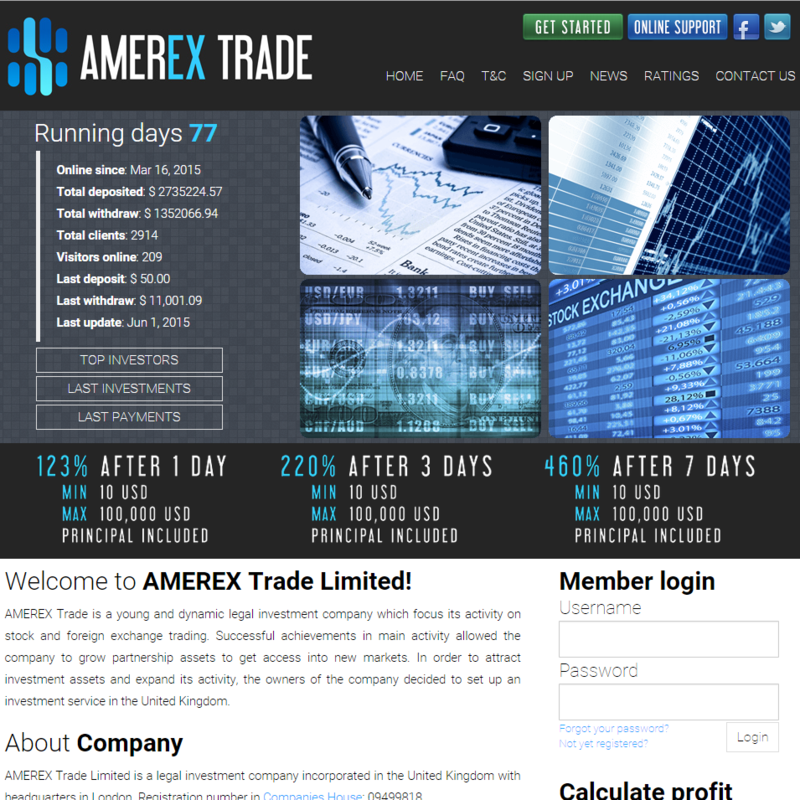 AMEREX Trade is a young and dynamic legal investment company which focus its activity on stock and foreign exchange trading. Successful achievements in main activity allowed the company to grow partnership assets to get access into new markets. In order to attract investment assets and expand its activity, the owners of the company decided to set up an investment service in the United Kingdom. 06.02.15 19:32	Account	Receive	+0.3	Received Payment 0.3 USD from account U7779210 to account U4731311. Batch: 91175626. Memo: API Payment. Withdraw to monitorinvestnet from amerextrade.com. 06.02.15 19:23	Account	Receive	+6.00	Received Payment 6.00 USD from account U7779210 to account U4731311. Batch: 91174823. Memo: API Payment. Withdraw to monitorinvestnet from amerextrade.com. 06.03.15 19:52	Account	Receive	+0.2	Received Payment 0.2 USD from account U7779210 to account U4731311. Batch: 91262274. Memo: API Payment. Withdraw to monitorinvestnet from amerextrade.com. Хочу отметить адекватную службу поддержки сайта. Несомненный плюс. 06.05.15 12:14	Account	Receive	+0.42	Received Payment 0.42 USD from account U7779210 to account U4731311. Batch: 91381490. Memo: API Payment. Withdraw to monitorinvestnet from amerextrade.com. Хайп покинут из-за постоянной отрицательной динамики. Последнее редактирование: 3 года 10 мес. назад от Gepardus. 06.06.15 21:45	Account	Receive	+0.2	Received Payment 0.2 USD from account U7779210 to account U4731311. Batch: 91494492. Memo: API Payment. Withdraw to monitorinvestnet from amerextrade.com. 06.09.15 16:26	Account	Receive	+0.2	Received Payment 0.2 USD from account U7779210 to account U4731311. Batch: 91691814. Memo: API Payment. Withdraw to monitorinvestnet from amerextrade.com. 06.10.15 20:48	Account	Receive	+0.4	Received Payment 0.4 USD from account U7779210 to account U4731311. Batch: 91792546. Memo: API Payment. Withdraw to monitorinvestnet from amerextrade.com.